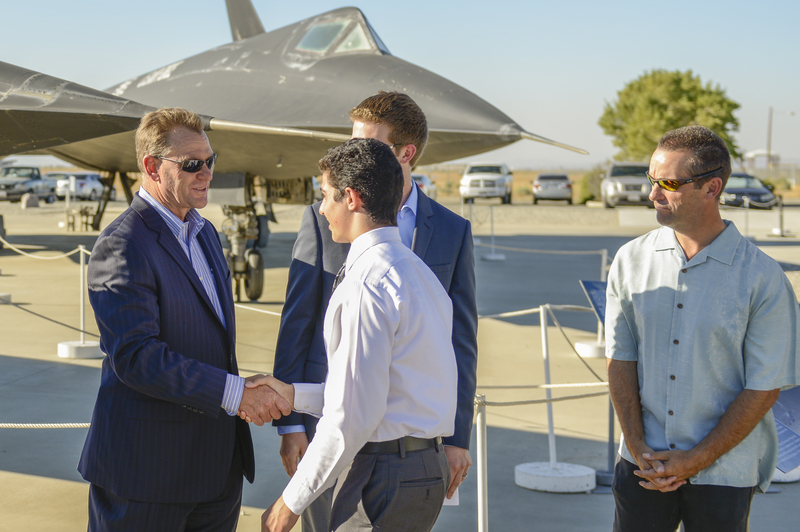 PALMDALE, Calif. â Sept. 11, 2014 â Northrop Grumman's (NYSE:NOC) Palmdale Aircraft Integration Center of Excellence partnered with the Los Angeles County Air Show to present scholarships to local high school seniors seeking a higher education with an emphasis in science, technology, education and math (STEM). The Los Angeles County Air Show Scholarship Committee selected five Antelope Valley students to receive scholarships for $1,000 each. The committee also recognized the students Sept. 4 at the Blackbird Air Park in in Palmdale, Calif.
"Collaborating with the LA County Air Show to present well deserving students with these scholarships is a real opportunity and privilege," said Andy Reynolds, vice president, Manufacturing Operations and Northrop Grumman's Palmdale site manager. "Northrop Grumman has a long history of supporting our communities in significant ways. A big part of that is STEM outreach, which is essential to helping the next generations prepare for the jobs of the future." This year marked the inaugural Los Angeles County Air Show, and, as the employer of 17,000 people in the county and 24,000 across Southern California, Northrop Grumman was a major contributing sponsor. The event attracted more than 100,000 attendees. "Given its heritage and its singular role in the aerospace industry, we warmly welcomed Northrop Grumman's participation in our inaugural air show," said J. D. Kennedy, Los Angeles County Air Show Founding President. "Collaborating with a company that is so committed to its communities and STEM has enabled us to establish an event that celebrates not just flight, but also futures."